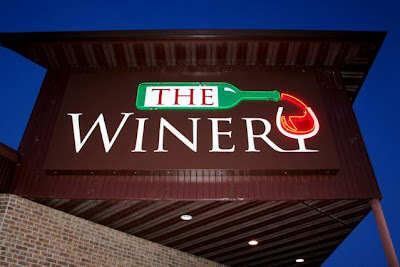 I was so happy that The Winery in Fargo reopened. It is a nice cozy place with some great values on wines. They have an all new menu and wine list offering very affordable options. I was there on Wednesday evening and had the opportunity to taste some nice ones. We started with a Bogle Petit Syrah. This is usually a nice affordable quaf and it didn’t disappoint us. There are two wines that I want to talk about though. 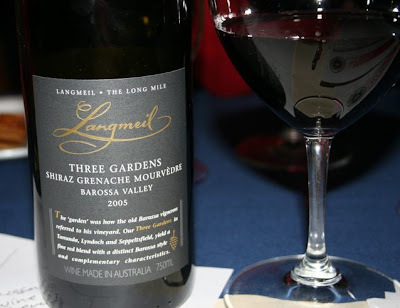 The 2005 Three Gardens was an incredibly complex and interesting wine. When first poured it had a very interesting mossy nose with earthy sweat sock smells that mingled with black cherry and spice. The pungent socks diminished with a bit of air time. On the palate this was full and lush. Actually I would describe it as soft and creamy. It had flavors of roasted vegetables, corn silo dust and sour black cherries. It had a good tannin structure and a long finish. Secondary notes were full of complex interesting things like green hickory nut hulls and spice. An excellent wine that I will be looking for again. 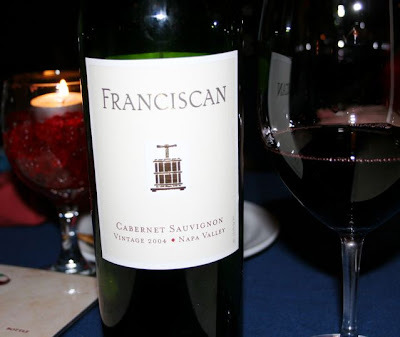 We also opened a 2004 Franciscan. The bouquet was full of cloves, tart cherries, green peppers with a side of blueberries. Another interesting nose. When I put this in my mouth I immediately knew this was opened way before it’s time. Can you say TANNIN MONSTER? So dry and puckering this one had more tannins in it than I can remember tasting before. It definitely needs a good five years in the bottle before it is drinkable. Aside from that it had flavors of chocolate covered cherries dusted with unsweetened cocoa and cassis. The finish was very dry and woody, undoubtedly due to the huge tannins. Because of that the alcohol felt quite hot. I think this will be a nice wine some day but that day is not now. Well, compared to the Silver Oak cab I had the other night, this really pales in comparison. But it only cost me $12. At that price point I would say it is not bad but I probably won’t be buying this one again. It has a few good qualities but a lot of things that really leave me lacking. It had a pretty good color – not as deep as one would like from a California cab. Someone described this as smelling like cherry cola and I agree. OK on the nose though with some fresh and fruity cherries but a little bit one dimensional and artificial. Nice initial fruit attack on the palate but diminishes very quickly. Subtle red fruits on the end but finishes alcoholic and dry. Ok for the price. There is something a little off on the end in the back of my palate that reminds me of motor oil and wood. That being said there is some tannin structure that may carry this through a few years. I’d like to taste it in 2-3 years but I would not be expecting much. We spent Christmas dinner at our dear friends’ home and the evening couldn’t have been better. Great company and terrific wine. One of the wines we had that evening was the 2003 Silver Oak Alexander Valley cabernet sauvignon. This is the most recently released vintage from Silver Oak coming out to the public only in August. It’s young and will definitely stand the test of time. I would love to jump forward in time 10-15 years and taste this side by side. Anyway, on to the tasting. This wine had a deep purple color of a young wine. The aromas were so very intriguing. On my first sniff I got hit with chocolate covered cherries. Not your typical ones though. These cherries were coated with dark sensuous chocolate. The next thing that hit me was the smell of toasted coconut. You know those coconut macaroons? It smelled just like those when they come out of the oven. On the palate this was like drinking satin. Big mouth feel and an explosion of flavor. Soft satiny raspberries and cherries with pepper and spice mingling with that dark chocolate and the slightest hints of leather. This was an enjoyable wine and is sure to have a long and interesting life. The first thing I think of when someone mentions Portugal is, of course, ports. I do love ports. But they also produce some very nice wines. 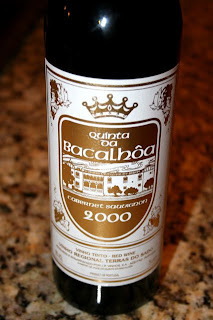 I’ve had a bottle of Quinta da Bacalhôa 2000 Cabernet Sauvignon in my cellar for a while and I thought it was high time that I gave it a taste. This wine is from the Terras do Sado region which is located in the southern third of the state just north of Lisbon. I can’t remember having tasted this wine before so this was a new one for me this evening. The garnet color had slight tinges of red bricks on the edges. When I first opened the bottled the nose was very vegetative with the slightest hints of black fruits and plums mingling with cigar wrappers and wet earth. The first thing that hit me on the tongue was this sensation of salty roasted mushrooms and alcohol. It was earthy and musty with a crisp biting acid. There was a strange woody flavor on the finish at the back of the throat. I could not detect fruit at first but a bitter kale greens flavor predominated initially. It sounds strange but at first taste the wine wasn’t great. However, after some time in the glass it opened up very nicely. Sour cherries started appearing and the funkiness began to diminish. After being opened a few hours it was definitely enjoyable. It was a little light in the mouth but had hints of cocoa mingled with those sour cherries and just enough of the pleasant vegetables to make for a very interesting and unusual flavor. It had what I can only describe as that European dirt on the finish which I tend to enjoy. Not a big wine for sure but one that would be quite food friendly with the acid. I think this might actually pair very well with roasted chicken or mild cut of beef. Our local wine shop has free wine tastings about once a month. There are usually 50-70 bottles of wine open for tasting setup around the store. It’s a nice event and really draws a big crowd. They offer wines at all different price ranges for tasting so you can have the opportunity to taste some things that you might not go and plunk down the money for without knowing it. Last night featured a lot of very reasonably priced wines from all over the world. I tasted quite a few and here’s a whirlwind of impressions that I got from many of them. How about we start with some white wines. Prices are the sale prices for the evening. 2005 PKNT Chardonnay $6.97 – vodka nose, light, pleasant, clean. 2005 Napa Ridge Sauvignon Blanc $10.97 – Grapefruit strong on the nose. Smack you in the face grapefruit flavor then it just disappears. 2005 Napa Ridge Chardonnay $10.97 – Pears, alspice and nutmeg on the nose and the flavor. Hints of oreo cookie creme filling on the back end hitting the roof of my mouth. 2005 Konu Baru Sauvignon Blank $9.97 – simple nose with clean simple taste. Not very distinctive. A little light. Did I say clean? 2003 Marcelina Chardonnay $17.97 – Classic chardonnay nose with oak and buttery apricots. Hints of green apple and peaches on the flavor. A nicely structured chardonnay. I certainly tried many more reds than I did whites. And I forgot to write down the vintage on some of them. Penfold’s Rawsons Merlot $5.97 – Hings of tequila on the nose. Not bad, good balance with some cassis flavor. A bit on the light side. Penfold’s Rawsons Shiraz/Cabernet $5.97 – musty nose with black fruits. Good tannin structure and blackberry flavors. Pretty well balanced. A great buy at 6 bucks. Penfold’s Rawsons Cabernet $5.97 – Musty herbal nose. Light body and a little blah. 2006 Layer Cake 100% Shiraz – big wine, needs to open up some but has nice flavors of chocolate, blackberries and raspberries. A little bit short on the finish, but it was quite tight when I tasted it. Black Box Paso Robles Cabernet $18.97 (3L) – Definite sour cherries with a jolly rancher smell. Light finish but pretty good fruit. Not bad for a box. 2005 Wolf Blass Merlot $8.97 – Light musty dusty nose with similar flavor profiles. Ok but not great. 2004 Wolf Blass Shiraz $8.97 – Diesel fuel nose. Not very balanced. Harsh on the back of the throat. 2005 Wolf Blass Shiraz/Cabernet $8.97 – Big fruit nose, sharp alcohol on the back of the throat. Flavors of cassis and red berries. Much better than the Shiraz. 2005 Wolf Blass Cabernet $8.97 – musty sweat socks meets basil on the nose. Big fruit on the tongue with slight herbal oregano notes. Black cherry comes through. Kono Baru Shiraz $9.97 – light color. Alcoholic on the palate with a light finish. Nice flavors of chocolate and raspberries on the fron tend. Kono Baru Cabernet $9.97 – Penzoil service station smell. Some fruit, nice taste, light on the end. 2005 Mia’s Playground Cabernet $8.97 – Big red jammy fruit nose. Red raspberries and blackberries on the palate. A slightly strange aftertaste but not really unpleasant. Hard to describe. A good solid wine but not a serious cab. 2005 Geyser Peak Cabernet $12.97 – Nose filled with cranberry aromas. Soft fruit on the palate. Mid palate and finish is very disappointing. Nothing there but dry wood. Redwood Creek Pinot Noir $5.97 – light color and light in flavor. But some resonating red fruits with toasty oak. The oak almost covers it up though. Redwood Creek Cabernet $5.97 – very blackberry. 2004 Marcelina Cabernet $23.97 – Vanilla, oak, cherries and cassis on the nose. 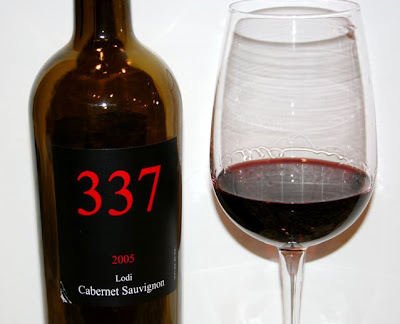 Very nicely balanced with red fruits and hints of vegetables and mushrooms. Beringer Napa Pinot Noir $20.97 – Definitely toasted oak on the nose. Light but complex fruit. Hard to describe. A pretty good pinot. 2005 Beringer Knights Valley Cabernet $21.97 – Chocolate and cherries on the nose but you can’t taste this on the palate. Hardly any fruit. Earthy and tannic. 2005 Chateau Souverain Merlot $16.97 – Sour cherries, blackberry jam. Balanced and very nicely structured. Still good tannins that will let this one age. Maybe give it a few years. 2004 Chateau Souverain Cabernet $17.97 – Nose is very interesting with cherries and something that reminds me of the dentist – fluoride? tooth polish? Nice fruit and strong tannins. Another one to age for a while. I also tasted a couple of sweeter ones. Luccio Moscato d’Asti $10.97 – nose full of tangerines and apricots. Definitely a stone fruit taste. Sweet and balanced. A nice effort for 11 bucks. Nachtgold Eiswein $16.97 (375 mL) – Apricots with a bit of petroleum on the nose. Very apricot on the flavor. Not too complex. Sweet but not cloying. Good acid.